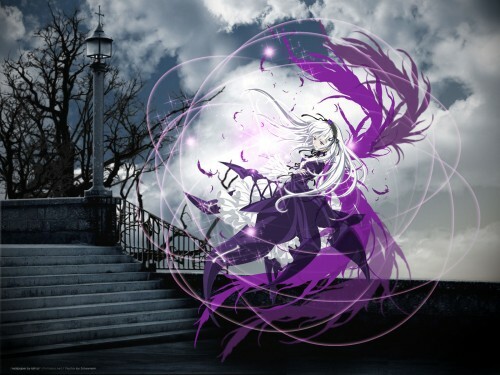 Rozen Maiden Wallpaper: .:. Requien for Afar .:. Minitokyo »	Rozen Maiden Wallpapers » Rozen Maiden Wallpaper: .:. Requien for Afar .:. I 've done this wallie a couple of weeks ago... but I just forgot and just now I'm submiting it XD! The stairs and lamppost are too blurry and don't fit well with the bright and clean vector. The sky colors also don't work well with the colors of the character. the idea for the wall is very good and the chara and the effects look great, but the bg somehow doesn't fit to it. Not saying the bg is bad, It's very good just like to see something new. Lighting good as always, esp the clouds, very realistic. The effects you have arround the vector look really great :D But, like other members have said, the background doesn't seem to fit with it. Overall, it looks good ^^ Keep it up! Such a cool background! The vector is pretty too! The trees look a little blurry though and the colors of the vector and background don't seem to blend/match well with each other. Other than that it looks nice! This wall looks pretty nice, but the lamp post looks flat, it doesn't look round enough. The sky doesn't really match the scene of this wall in my opinion. I think a dark sky would look better, but that's just me. Good job with the Rosa Mystica. Wonderful wallpaper! So beautifuly done^_^..... Great work! Oh so dramatic. Beautiful effects, love the scan and the background too. Well done~! Good work from you and thx for sharing..
very NICE ~ ! I love it , think you ~! beautiful wallpaper, the background is good. the purple effect is pretty, like it. ^^ colours and texture is good. I love this wall! It looks so awesome! Cute colors! ^______^ Great job so keep it up! Muito lindo o wall, adorei! wow, very beautiful, excellent the effects, colors and ambientacion, suiginto is seen very beautiful, good work, I loved it, thanks. Suiginto forever! I like this picture, the effect of 2D and 3D dimension is very good. A few people can submit or have this touch for shower.